Last weekend, I found an interesting link on Android AppStorm on beautiful replacements for the default launcher on your device. A Launcher is the default home screen on the device and displays the launch icons for all the installed apps. Like almost every component on Android, you can install different launchers just as you could any other application. Launchers not only change interaction models but also icons of the installed apps. I had been vaguely aware of launchers but had never tried one. But the designs on the AppStorm link looked really awesome so I installed ADW Launcher on my Galaxy Tab and have since been trying a bunch of themes. 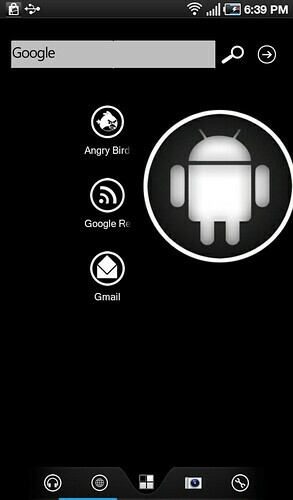 Check out a couple of screenshots of my Galaxy Tab, running the AndroidPhone7 theme and Buff theme. The themes I have been playing with so far have been pretty awesome and I keep finding great icon designs for the different experiences. The icing on the cake is that ADW is an open source project as is LauncherPro and am sure some others as well (This post lists the different Launchers that seem to be popular). Some of the other launchers, like SlideScreen for example, completely change the traditional launch screens. 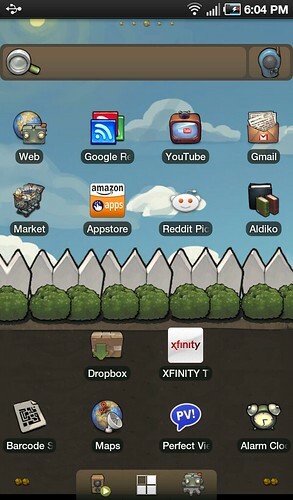 Its awesome that Android enables this kind of customization. (I hacked my old iPhone a couple of times to enable custom themes on it, this article on the Cult of Mac lists 15 of them, but require you to jailbreak your phone to enable them). My main phone still remains the Google Nexus 1, which I really like but am now in the market for a new phone now that my contract is finally up. I have never liked the customized launchers that the different device vendors pack and so have been hesitant about getting something besides the Nexus S. Knowing that I can swap out the Launchers makes me feel a lot better about being able to control that experience. I’m using it to, it works well. I also recommend the Rabbit Launcher….it is still very new…but it is quite light and fast despite having great 3D effects. And it’s free, too.